While most of us here on Android Police use third-party launchers for their added customization options, many users stick with the default launcher that comes on their device because it does the job well enough. One of the reasons I switch to Nova is gestures, because I love swiping down on the homescreen to open the notification panel, since reaching the top of the display can sometimes be cumbersome, especially one-handed. Previously, Samsung's TouchWiz Home launcher (I thought they'd retired that TouchWiz name a long time ago) had swipe up and down gestures, but they both served to open the app drawer. That's a wasted opportunity, and Samsung seems to have noticed it too. 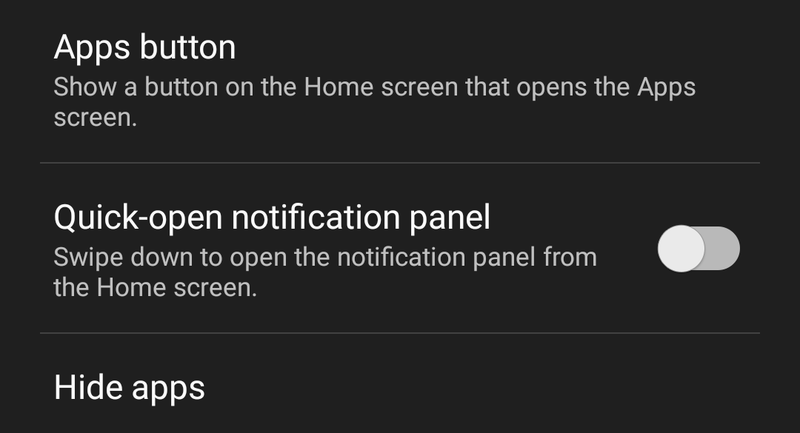 The latest TouchWiz Home 6.1.50.2 adds a new toggle in the settings that lets you assign the swipe down to the notification panel. The swipe up still opens the app drawer. Once you enable the toggle, it does its job and that's about it. I tested it on my S7 Edge and found it works the same as Nova. I'm still not completely convinced to switch back, but if you are or if you'd like to give it a try, you can grab the latest Samsung TouchWiz Home 6.1.50.2 from APK Mirror or from the Play Store.